Among various niches, fashion is the niche that is most popular on WordPress theme category of ThemeForest, with 700+ items, with average conversions ranges from 300 to 800 sales, with 40 top sellers. This niche is also a non-stop trending topic (via Google Trends report). Below are more than 10 WordPress fashion themes that helps you boost your sales for your online fashion store. Each theme comes with a preview picture, sales and ratings, as well as the reasons why it fits with your online fashion store. We tried to include all kind of themes for you to choose. If you can not find the right theme for you on this collection you might want to check other theme collection. Best WordPress Fashion Store Themes or Best Responsive WooCommerce Themes 2016, ll always be refreshed. Being a best-selling WordPress fashion theme on ThemeForest since August 2014, Fashion helps you build and maintain a fashion store with minimal and chic design. With 4 homepage demos and promotion banners, you can easily create sales campaigns for your fashion store with zero knowledge in tech and design. Fashion was also built on Bootstrap 3, which makes it fully responsive on all screens and devices. A flexible creative WordPress theme for your fashion store. ClickBoutique is built based on Bootstrap, which make this item fully responsive on any screen sizes and devices. Catalog mode helps you easy to show your collections and lookbooks like a professional studio. This item comes with one-on-one support for all purchasers, along with visual tutorial videos on Youtube. Kloe is a multi-design WordPress fashion theme. Smooth and responsive design, along with “Kloe specials” elements like Portfolio Showcase, Interactive Banners, Video Presentation, etc. This theme can be used in various situations, either for a portfolio, online shop, website for a modelling agency, or a fashion blog. No coding experience required. This is the versatile responsive WordPress eCommerce theme for your next fashion store. This item comes up with various eCommerce elements that support your online business, like Product Deal, Product Featured Video, Lee Banner, Best-selling Products,… Get ready to skyrocket your fashion store! For fashion and apparel, as well as other industries that need a visual presentation. This WordPress eCommerce theme comes up with unlimited homepage variations, and fully responsive layout for all devices, as well as popular plugins like latest WooCommerce and Visual Composer version. A WooCommerce-based theme that perfectly serves your needs for a fashion store. Unlock the power of customization with built-in X-menu, 11+ homepage layouts, and 10+ unique header layouts. Moreover, Zorka gives you a massive library of 500+ Google fonts and 600+ Font Awesome icons. A minimal WordPress fashion theme for your clothing store. 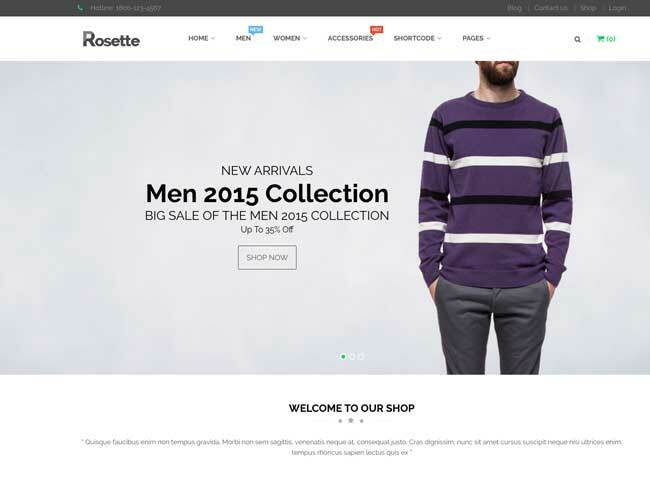 Rosette provides you a simple but conversion-centric design, with promotional banners on product category pages, drag & drop pricing filter, interactive banners, and so on. Get ready to build your fashion store in a blink! Fashionable, minimal, responsive,… these are all keywords we may heard about this WordPress fashion theme. Vanesa includes 10 unique design layouts, along with various eCommerce features such as ajax shopping cart, hero image, Portfolio with filters, etc. Built in latest WordPress version, and integrated with latest WooCommerce platform. Jakiro is a WordPress eCommerce theme designed for fashion shop owners. This theme is known for its full-width and parallax homepage layouts, which brings your online apparel shop a fully responsive look on all screens and devices. This theme is integrated with WooCommerce – a well-known eCommerce plugin, as well as latest WordPress version. Jakiro promises to always bring a perfect performance for you online business. Back to vintage style with this fashion-focused WordPress eCommerce theme from WooRockets. Ferado is packed with 4 unique homepage layouts, 2 header styles, and eCommerce elements for your fashion store. Easily build up the look for your store from 6 color schemes. Zero coding and design experience needed! Now you can sell clothings and accessories on website and mobile devices just with a WordPress eCommerce theme. MidNight is specially designed for all your needs for a fashion shop. Easily to collect customers’ email and social networks for promotional purpose. Better customer support with built-in multiple pin support.. This theme is packed with 60+ layout elements which can be used to create any pages you like. 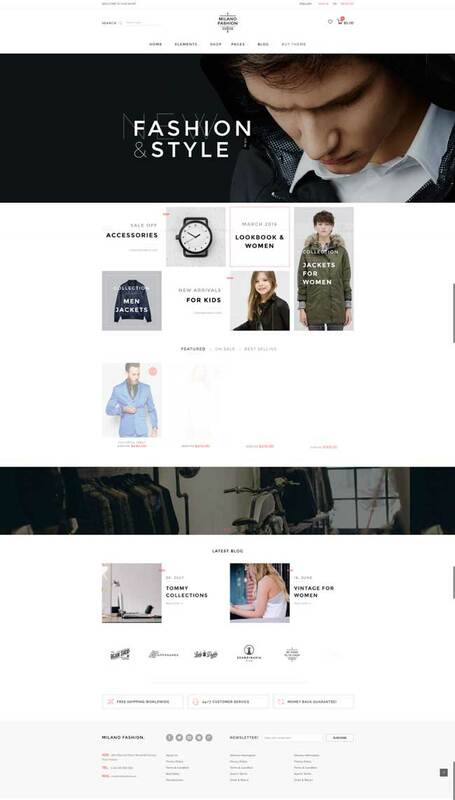 This ultra-HD Fashion WordPress theme from WooRockets works best with street fashion stores. With ready sample data, there are minor customizations needed to build your online fashion store in few minutes. Ninja comes with various eCommerce features like order tracking, popup promo box, product live search, and much more to explore. Need a fashionista look for you clothing or accessories store? Watch out this all-in-one solution from Elise. With amazing sliders, it has never been easier to show your collection’s lookbook, promote for any seasons or holidays, or simply boost sales for a featured product. Elise is power with well-know Redux framework with powerful customization ability. Besides, your favorite Mega Menu plugin is also included in this package. Those above WordPress fashion themes are only some items that best known on ThemeForest marketplace. Do you know any WordPress themes that are matched with this list? Please share them with us on the below comment section. We are working on Nitro – a solution for WooCommerce shop owner. Click here to learn more about our project.